Home » All News » On Your Mark, Get Set, Go…Raider Racer! On Your Mark, Get Set, Go…Raider Racer! When the STEM crew finished production this week, the Raider Racer sported a blue and white exterior. Of course, what other colors would do? 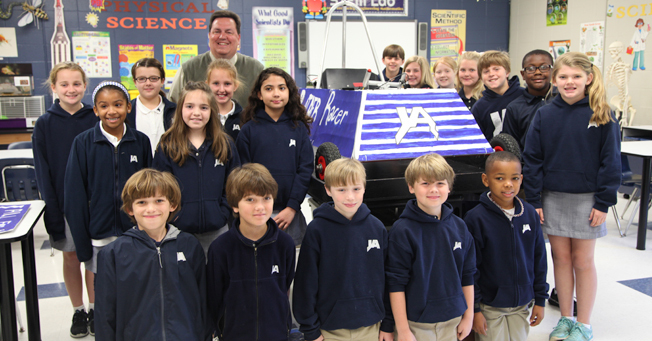 Jackson Academy fourth graders are designing, building, and racing an electric car. The new program at JA is one way of fostering interest in science, technology, engineering, and math (STEM) fields. This initiative is part of a program called Greenpower that seeks to advance education of technology and sustainable engineering. Besides learning teamwork, students become more aware of how various challenges of society can be solved through engineering and other STEM related fields. Every fourth grader will have an opportunity to drive the Raider Racer, which runs 17-18 miles per hour. “The same sentiment was expressed by each of the children after they drove it around the football field: ‘It went a lot faster than I thought it would!’,” said Cliff Powers, Lower School STEM teacher. Ultimately, the top driver of each fourth grade class may compete to become the one JA driver at a competitive Greenpower race with students from other schools. Currently JA is in conversations with another Greenpower school in Huntstville, Alabama, that participates in races. Greenpower is primarily in the United Kingdom and held it first event in 1999. Greenpower now works with 500 schools and 8,000 students in the UK, according to the organization’s website. JA has plans to increase its fleet with cars designed for Middle School students. How did students react to the opportunity to work on the Raider Racer? Cliff Powers I have never seen the kids more excited about any project they have tackled. Even though they have constructed robots, amusement park rides, machines and structures, this was the first object that they would actually get to ride themselves. They couldn’t wait to get started! Harriett Eppes To say that the children were so excited to have the opportunity to build the car is a huge understatement. They came back to class after each STEM class telling me what part they worked on and how it would help the car run. What learning outcomes did working on the car together meet? Harriett Eppes Building the Raider Racer required working together with each person being responsible for their “part.” The give and take of working in a group is something that is necessary as a life skill. It goes without saying how important following directions is, and they had to do that throughout each step of the building process. Cliff Powers Aside from the engineering and construction aspects of the project, this was a great opportunity for the children to work collaboratively. Due to the sheer volume of work involved, it was imperative that they work as a team to accomplish the mission. 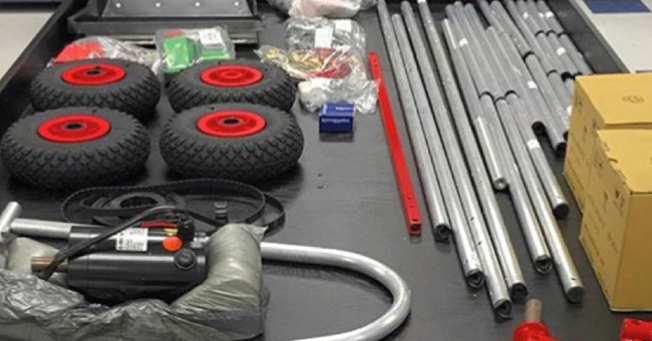 Small groups were assigned specific sub-assemblies of the car such as front/rear axle, steering column and graphic design. Students were highly motivated to be involved in the process and, as such, their own learning. How do you think this can help students in the future? Cliff Powers Learning to work cooperatively with others is one of the many life skills cultivated through STEM education. Because the children realized they could not build a project of this magnitude on their own, it intensified the need for good teamwork, time management, and community spirit. Each of these disciplines will pay huge dividends for our students as they enter the work force as young adults. Harriett Eppes It can help them in the future not to be afraid to try something that is out of their “comfort zone.” Hopefully, they will also realize that participating in a project and doing your very best is very satisfying. What was the best thing that happened while you were building the Raider Racer? Harriett Eppes I loved the fact that my students told stories about the great things their classmates did before telling me about their part of the project! They are so excited about the “first run” of the car. Cliff Powers For me it was watching the children learn to handle and properly use a variety of hand tools. For example, watching two of the girls work successfully with a socket wrench and vice grips was incredibly rewarding. The real excitement for the kids isn’t so much driving the car, but rather the simple satisfaction of knowing that they built it themselves. I couldn’t be more proud of them.